With the International break being an unwelcome diversion for most people, I thought I'd use the time to compare where we are now with how the Premier League looked at this stage last season. Looking at the table there are some good and some bad things to take out of it for Swans fans. 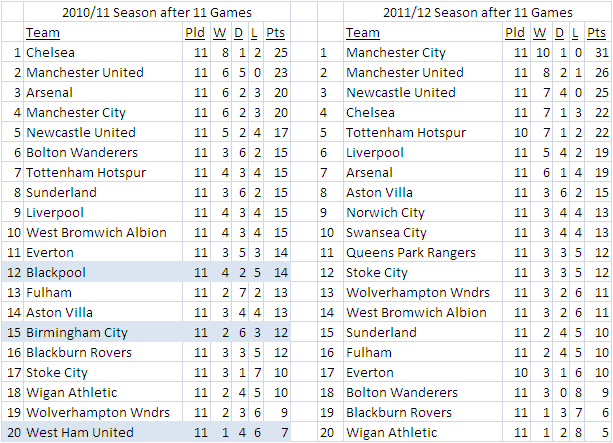 The main positive is that both Wigan and Blackburn have fewer points than West Ham did last season. It also shouldn't be forgotten that Wigan's 5 points came from their first three games and against the three promoted sides. Blackburn's win against Arsenal was a bit of a freak with Arsenal scoring two own goals, although since then luck seems to have deserted Blackburn (and long may that continue). If we cross our fingers and hope that neither Wigan or Blackburn turn things around, then that leaves one relegation spot left to fill. This could arguably be one of anyone outside the current top seven, Newcastle's start has been so impressive, even if the wheels come off they should still finish in the top ten. The return of Davies and Klasnic and the subsequent 5-0 thumping of Stoke suggests Bolton are in a false position and I'd expect them to finish around 12-14th, similarly Fulham have a squad that is far above their current position and were desperately unlucky against Spurs. I'd also say Everton are far better than their current position but that they are a club that could just as easily be bankrupt as challenging for the Champions League in 3 years time. If Moyes suddenly decided he'd had enough they could be in trouble but I couldn't imagine them going down with him in charge. That then leaves a number of OK, but not great teams such as Wolves/Stoke/West Brom/Sunderland/Villa along with the three promoted teams. I don't think Villa will lose too many games and although won't be dazzling should be fine along with Wolves and Stoke. My guess is that West Brom and Sunderland will struggle along with one of the promoted teams running out of steam. The assumption is that if QPR need extra bodies in January then the money will be there, which leaves us and Norwich. Both teams have played good football but it'll need some luck in avoiding injuries to key players to make sure the momentum is maintained. On the plus side Swansea were 2/1 to stay up (33%) after the play-off final but are currently 2/5 (71%), the downside is that last year Blackpool had a point more than us at this stage but went down. The main difference is that Charlie Adam was a huge part of that Blackpool team but was arguably not the same after the on-off saga of the possible move to Liverpool, as long as our squad doesn't get destabilised with any of them suddenly thinking it's their right to be off to a 'bigger' club I see no reason at all why we won't stay up.